Like the tutorial above, you'll need to set up a Google Spreadsheet with several column header categories. For the purposes of this tutorial, we'll use: "html", "description", and "duration". Again, you will have to make the spreadsheet publicly available. 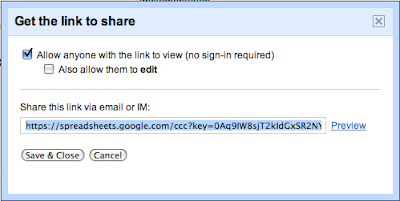 On the right, click Share, then "Publish as a web page". 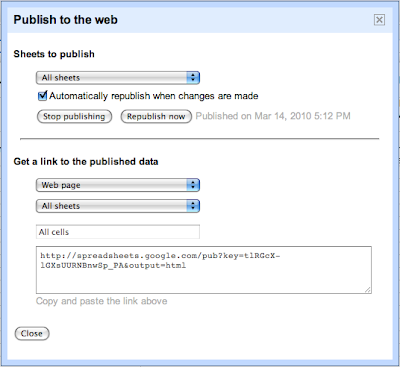 From the pull-down menu, select the page you wish to publish and click "Start Publishing". Be sure that the link to the published data is set to "Web page" and "All sheets". Once you've done that, you should see the Spreadsheet data populated into your page with the appropriate formatting that we've indicated. This can includes links, bolding, italicizing, font colors, etc. Again, would love to see any other uses of this code that you come up with. Please feel free to leave comments below on any successes you've had.